Pop and I recently had the two youngest of The Growing Table family for several days when their parents made a trip out of town with their two middles (the big boys were with EJ's folks) and one of the highlights for them was driving our two little battery-powered jeeps...BUT...I have to tell you that keeping these fellas headed in the right direction is an activity requiring hands-on adult supervision! Then there are the bigger fellas riding the dirt bikes (also battery powered) and keeping them on a larger and more free path while steering them away from dangers like barbed wire fencing requires nerves of steel (which Pop has but I somewhat lack). 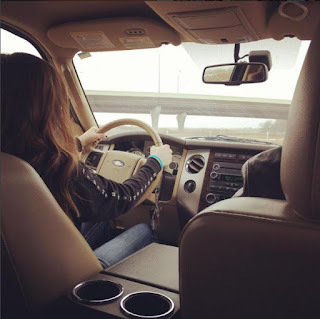 Then there is our oldest grandchild, Lou Lou who is driving with supervision now. She only scares me when she is fiddling with the radio. Ha! 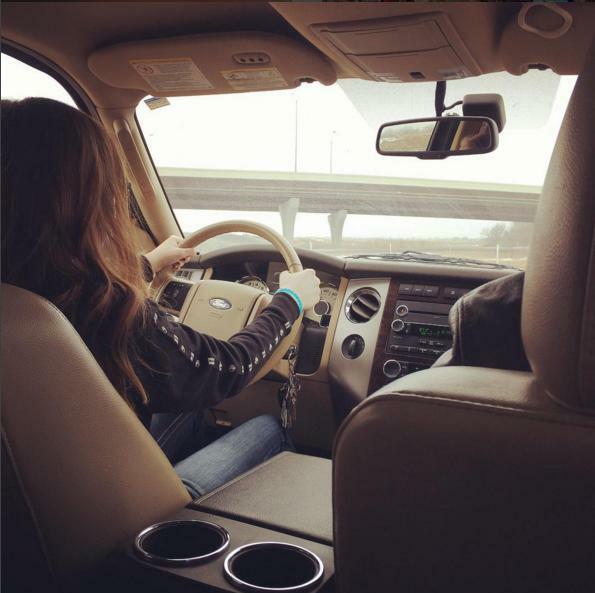 She really is developing into a fantastic driver; but still, supervision and instruction is intense in the beginning! Sometimes the task of guiding children can be overwhelming and feel like disaster is looming large. The task of guiding children...whether driving or in general is a hard job. Kudos to all the parents out there (my daughters and sons-in-love included) who stay vigilant and lovingly guide their children. May God multiply your efforts and bless you richly! Some would say that you can't go home again...and I understand their meaning...nothing stays the same and though familiar, "home" is different. Early in 2015, Farm Chick phoned Pop and asked him if she and seven of her "closest friends" could move back to Four Sisters Farm for a while. With Pop and I it was a no-brainer. We had lived with The Growing Table family before out at Four Sisters Farm and we knew we could do it again. The plan was for Farm Chick and EJ to list their "city" home and build their barnhouse on EJ's family land while living at Four Sisters Farm. They estimated it would be from the end of April to mid July but we weren't holding them to it...construction projects never go quite as intended, right? What was different this time was that when we lived together before, EJ and Farm Chick only had two...then three children. Farm Chick and I enjoyed our time together before with a ready coffee drinking female close by and a Grammy and Pop always happy to see some grandkids so we proceeded. Pop and I moved back to the basement apartment where we lived before. We tried to make room for a family of 8 on the main floor which is three bedrooms and two bathrooms. It was good timing with the spring, then summer weather so the kids could get out and run...and run they did! The backyard at the city house was spacious but not as spacious as Four Sisters Farm! Pop and I had some travel scheduled during that time and it was a great fit having someone at the farm to feed cats and watch over things. We didn't get to help much on the build which made us sad but when it was all said and done, EJ earned the respect of all. He slept at the farm but between working his full-time job and putting in MANY hours at the barnhouse, we rarely saw him! Farm Chick stayed REALLY busy with running her household with much less help from EJ and making decisions about the house. God truly blessed our time together and blessed EJ and Farm Chick as they built their barnhouse. There is really no explanation for the build going as well as it did except for being in God's favor...and Dennis the handyman which would be a whole other story which would like likely be called, "Two Story Stories"! Head on over to The Growing Table if you want to know more about their fabulous new living space. Now...to the other Four Sisters...who wants to see if they can go home again? Pop and I love you all!